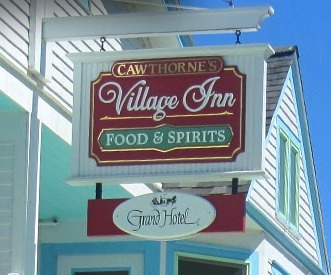 Cawthorne’s Village Inn — formerly the Village Inn, established in 1981 — is Grand Hotel’s newest casual dining option. Located on Hoban Street and just a block off Mackinac’s Main Street, Cawthorne’s is open year round and features seasonally changing menus. Choices include the signature planked whitefish, special selections using Michigan products, several organic dishes; and favorite of hotel guests, the Grand Pecan Ball. The street-side patio is the perfect place for summertime drinks, lunch or dinner. Luncheon: 11:00 a.m. – 5:00 p.m.
During the season overnight guests of Grand Hotel on the Modified American Plan receive a $20.00 per adult credit towards the food portion of their bill. Stop by or checkout the Restaurant Events Calendar for daily specials and live music schedule. You can also visit our Facebook page for updates and events. Delivery service is now available Monday – Thursday from 5:30 – 8:00 pm. Minimum order is $15. Call 906-847-3542 to place your order.